Reading and Writing Redhead: Buy One, Get One Free Sale! Yay! Just today (Saturday) and tomorrow (Sunday January 27) I am offering a buy one, get one free item at both of my teacher stores. Just buy one item choose any other item from my store for free, as long as it is equal or lower price! All you do is purchase something and then email me at readingandwritingredhead@gmail.com, tell me what you bought and what item of equal of lesser value I can email to you! What a deal, huh? You can either shop at my Teachers Pay Teachers store here or my Teachers' Notebook store here. Thanks Irene! 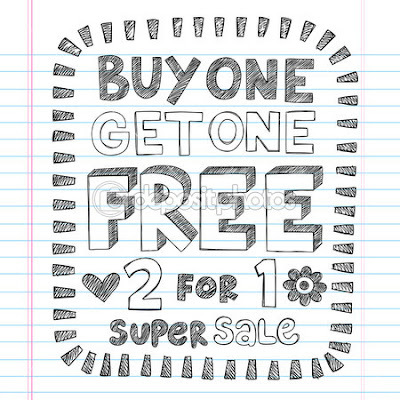 I never tried a buy one get one free sale but we will see if it has any takers! You are my kind of lady liking the Little House books. I think I have every book ever written about the real family. I have even been to all 9 sites where they lived. I love them!!! I met a couple out in Michigan that takes LH tours every year. That's who I traveled with. FUN!!!!!! Susan, I am envious that you have been to all of the sites where they lived! Are any of the buildings still there? Thanks for stopping by!